There is a reason why we have a category all by itself on our website; the Durum Wheat quality is in a category all of its own. Arizona Grain has been a long standing player in the world wheat markets for years. Why is that? Simple, our grain is as good as the producers that grow it. Superb milling qualities, test weight, and color along with low moisture and high semolina yield provide wheat millers a quality product. High gluten strength and excellent protein levels needed to produce quality flour and keep wheat millers at home and abroad coming back for more. 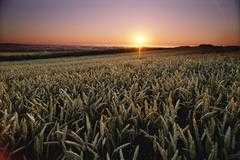 Arizona’s warm, arid, climate provide a perfect environment for quality durum wheat production . The hot days and cool nights in the last 60 days of our growing period provide a wheat that is very dry, with a dark golden, vitreous color. Rain is highly unusual during our harvest period, therefore our durum has very high falling numbers due to lack of sprout damage in the wheat. Our pride is in our genetics. The genetic purity program at Arizona Grain is a pure "start to finish" identity preseved program. It starts with a managed breeding program of our branded Valley Seed. The seed is then conditioned and manufactured right here in Casa Grande. Producers that choose to plant our seed grow our varieties separate and harvest them the same way. Harvested durum wheat is then stored and identity preserved at one of our grain elevator facilities and made ready for shipment. Our ability to sell a genetic variety of durum wheat and keep it pure and identity preserved "start to finish" is something few durum suppliers can accomplish. Thank you to our growers for helping us be a premier supplier of durum wheat in a world market.